You made a difference and we will miss you enormously. Your wisdom and understanding will continue to encourage. Your positive outlook, appreciation of life and love for those around you will always inspire. Your delight in and support for the girls will remain with them. A wonderful aunt and a GREAT great aunt. Alexandra has given out so much love and caring during her life and I, for one, feel very inadequate to express my appreciation of this very fine person. …. Bless you Alexandra, you lovely person, and thank you: you have given us so much. It is impossible to write of Alexandra in the past tense- she will always be alive in our thoughts and hearts. She was one of those rare people- a “good” person, everything a human being aspires to be: compassionate, beautiful, loving, - loving both people and all nature, from the flowers in her garden to the Scottish mountains, wise- you always came away from a chat with her having learned something - just as you always came away feeling HAPPY, and a better person yourself from having been with her. Most of all you remember her smile- that is such a perfect choice of a photo heading her website- it melts your heart. All my love to Alexandra, John and her whole family- little Abigail Alexandra all her life will know what happiness she gave her heart-warming Grandmother- and Thank You dear Alexandra for your friendship. A unique genius for friendship, for nurturing and sustaining relationships. She listened, shared insights and gently applied her ruthless logic, offering a new perspective and taking you forward in your thinking. 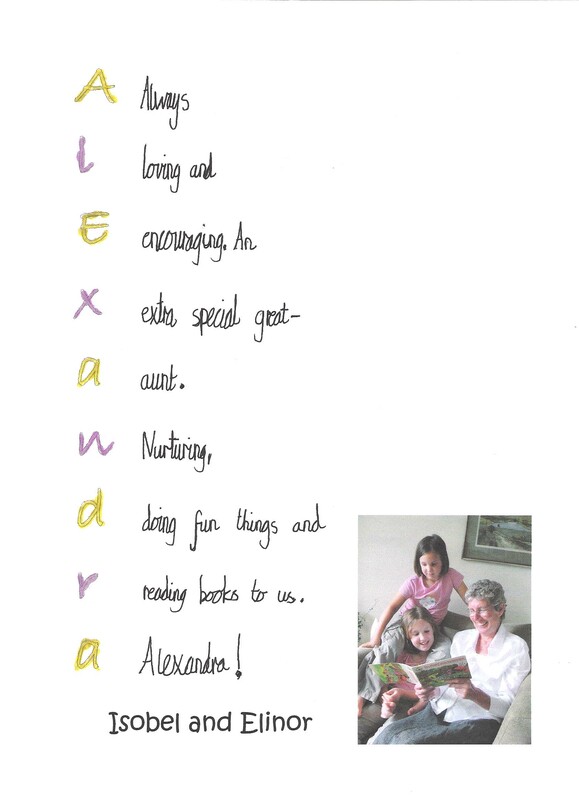 Alexandra was such a special person, with a unique blend of intellect, wit, humour, compassion and practicality. She gave so much to the world and to those of us who were fortunate enough to have known her. We will remember her always with gladness and gratitude. It is hard to express in writing the feelings that Alexandra invoked. John and Alexandra you welcomed us to your home as if we were immediate family rather than Gráinne's sister/nieces. We hold close the special memories and lovely times we shared with you in London and Ireland. I only met Alexandra twice; the first time just before her illness was diagnosed, and the second just after the birth of Abigail. But I know from my friendship with John what she meant to the family, and how much she will be missed. Alexandra has set the bar very high for friendship, hospitality and just fun to be with - I'll miss her a lot. With John (her partner in crime), they also blazed a pretty mean trail in the marriage department as well. What a woman and what a couple! of children. … She was a shining example of resilience and fortitude whilst facing illness. She will be greatly missed. I am so proud to be able to say that Alexandra was my friend. She was so understanding; compassionate; witty; oh I could go on and on but how does one define her? She was uniquely Alexandra and she was my friend and I loved her. She will live on in all the people whose lives she has touched. … we admired the enthusiasm and interest she had in everything she did. Still remember the evening we played Rummy Kub together in Ilford. Our prayers are with you. My memories of Alexandra are mostly of the early years of your marriage,especially coming to stay with you in Haworth. It was a happy house and I always loved visiting. I also remember Alexandra’s mini-mini skirts in the ‘mini days’ and Mum being aghast at the length (or lack of). I was secretly impressed and thought they were wonderful and kept trying to hitch mine up that little bit further ! Her death is a loss to everyone who knew her. Like all her friends and colleagues I found her to be wise, interested and interesting, great company, strong and kind. She is someone I will always remember and strive to emulate. Throughout many years working (and playing!) with John, you were easily the best perk to the job. A wonderfully balanced combination of energy & relaxedness, bluntness & tact, focus & warmth - and a fabulous chief cook & bottle-washer to boot! It's been a pleasure and a privilege for me to have my share of you, and truly inspirational to contemplate how many others have drawn from the same well without exhausting the supply. So much woman, so little time. I did not really know what to expect when I first had the opportunity of teaching with Alexandra at first coming to LLU+ and I quickly came to rely heavily on her knowledge, sense of perspective, and unflappable, kind nature. For me, she will always stand (in the world of dyslexia at least) for quality, rigour and intolerance for 'sloppy thinking'. Her "This will not do!" reverberates through my thoughts and has, at least in my mind, been the defining kite-mark of proper standards and I seem to be repeating it at increasing intervals. I have the very great pleasure, now tinged with great sadness, of seeing her smiling but indefatigable expression when I do. Words are simply incapable of expressing how this feels.I feel privileged to have known her a little, and been affected a great deal. I first learned of Alexandra's illness in rather poignant circumstances; I was waiting for my wife, Din, in the foyer of Bart's Department of Nuclear Medicine, there's only one reason you wait for anyone there and the general atmosphere was, shall we say, sombre. I don't know which of us was the more surprised, or taken aback, when Alexandra walked in and we both realised what that meant. Having registered with reception, Alexandra, came over to sit with me and, being Alexandra, grinned and said, "Well, I'm sure I don't know what the right protocol for this is!" For some ten minutes we discussed the impact of her diagnosis and the prospects - she explained that she had always imagined that to hear such news would be devastating, that everything would change, never be the same again but that, in reality, it had not been like that. Ever clear-headed and thoughtful, she explained that life carried on much the same but with, her words, a certain calmness because uncertainty was gone and she felt strengthened by that. I hope that calmness and strength stayed with her, it is how I will remember her. knowledge, shared one’s passion but was meticulous about standards. As someone with a slight tendency to chaos, this was very helpful. She made me feel very clearly that second best from one’s students is not acceptable, particularly those who will be working with vulnerable young adults. Professionally, she is one of the clearest thinkers I have met who has a brilliant ability to understand complex ideas but also dots “i”s and crosses “t”s. It was during this time that Alexandra was diagnosed with breast cancer. We began to be much more closely in contact and she was very supportive to me in a number of difficulties I had. Even when she found last year that she had incurable secondaries, she was always involved with the rest of life. She was uncompromising in being honest about the disease and her feelings about it. The last time I spoke to her I told her that she has been an inspiration to me about how to live life as well as how to face death. She will always be part of my “inner” landscape and I will always value the time I spent with her. It was a privilege to have met someone so outgoing, warm and considerate as Alexandra. We experienced some very happy times with Alexandra, John and their lovely family. It is so very rare to meet someone who possesses all the qualities that make life so worthwhile. Alexandra will be missed greatly not only by her loving family and extended family but by all whose lives she touched, even if only for a short time. Michael and I are so grateful to have been lucky enough to have spent some time with Alexandra and John in recent years in Ireland and this Summer in the U.K. She has had wonderful love and support from her family and has been blessed to have them around her during the final stages of her illness. Our thoughts are with John, Catriona, Alastair, Grainne and Nick at this time. She always wanted to know, always had such a wise and sensible way of seeing things and was always so supportive and reassuring.It was typical of her life that she was interested in ours, even when she might quite understandable been more preoccupied with her own concerns. .. .. However she didn’t tolerate sloppiness, poor quality work or low standards. I can still see and hear her saying ‘Oh, that just won’t do’. She had a very sound moral sense and you knew she would always give, not just sensible and practical advice, but also sensitive advice which considered the views and feelings of others. She treated her approaching death in the same way she did the rest of her life – with thoughtfulness, common sense, practicability and openness, in spite of physical suffering and the knowledge that she would lose all that she loved. I have known Alexandra for most of my life and have always had the most tremendous admiration for her. I remember her as someone who was amazingly energetic, warm, strong, and, above all, always interested in other people. When she visited a while ago she disappeared almost immediately. After a short search, she was found to be curled up on my daughter's bed reading 'Sam Vole' to the children. The children are pretty discerning, and I can't think of anyone they took to quite so quickly, which says it all, I think. She will be very sadly missed by all of us. .. I remember well a lovely holiday, staying with you in Haworth; I remember the Bronte museum, walks on the moors and the ruins of Wuthering Heights. I can picture Alastair on his mum’s back in his baby rucksack and sampling tuna fish for the first time ! ..
.. Alexandra helped me see and understand so many things. I will treasure, always, the memories of time spent together and how much love and support I received form you both. beneficial presence and influence in my life, and I’m delighted she was my friend. It was really nice to meet the lovely person in you. I remember all the little memories till date – when me and my sister Linse first met at Mumbai airport in the first week of December 2004, when we met at Liz's house in Belmont Road, and then at your beautiful home (your garden is simply splendid), when we went to a London shopping and then at our home in Mansfield Road….. Every small meeting is remembered only because you made them all special with your little caring ways. Not something we will forget. You were ready to help as soon as it was requested. Me and Manoj will remember you in our prayers. Your memories will always bring along your ever-smiling face to our minds. Lanky and slender she might look, Alexandra was the embodiment of utmost wisdom, strength, warmth and kindness. A neighbour of ours since we moved into our house 2 door away just over 22 years ago, she was ready to render help and advice when approached, showing the most sublime smile and a heart of gold. A great lady and a privilege to know. We shall all miss her terribly. A group for mums where children thrived too. keep a talking caring friendship near. Very touching to read what you, family members,and others have written about Alexandra and look again at all the pictures with her. It made me cry ( I know she wouldn't like it). In my life I have met very many people and among them there are people who are very special and dear for me and Alexandra is one of them. Alexandra was our neighbour for nearly thirty years.We shared an interest in under-fives and in our gardens, that were periodically inspected. She was one of the most generous people I have known. I remember her coming round with half a dozen plums in her hand, which she insisted on giving to us, although the crop from her tree was not plentiful.She had a flair for friendship and was loved by those who knew her. People were drawn to her by her kindness, intelligence and her willingness to listen to them. She was genuinely interested in our lives and wanted regular updates about our families. That interest did not flag throughout the time left to her. Alexandra faced the end of her life with immense courage, determined to make the most of the time left to her. She accepted her increasing need for help, caused by the hardships of her illness, with astonishing calm. Throughout, this acceptance somehow led to a tranquillity. Visiting her enabled me to set aside my own anxieties and so become calm in my turn. Alexandra loved the very young and took great pleasure in her "niecelets". Abigail was her joy and I am glad there are photos of the pair of them that Abigail can look at as she grows. She was a wonderful woman, who enriched all who knew her. She will be greatly missed. Alexandra was my tutor on a dyslexia trainers’ course at LLU+ and she as such a wonderfully kind, charming and inspiring person that I have never forgotten how she helped me to become a much better trainer. Alexandra seemed to have a really keen interest in people and how they worked. She inspired me to read, think and work very differently. I think she will be missed very much in the worlds of dyslexia and literacy, but I know her influence lives on.